The Elusive Stereo Rose Returns! I was actually surprised at how long this was available on MAC’s website before selling out. 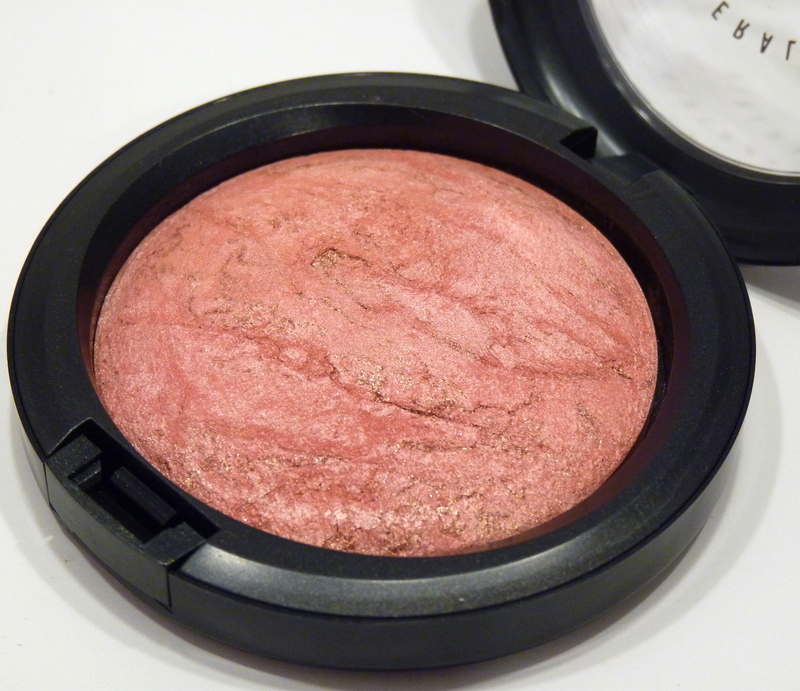 I’m happy to have my hands on MAC’s Stereo Rose Mineralize Skinfinish ($29 for 0.32 oz./9 g.), as, I’m sure like many of you, I missed it the last time it was released in 2010. It is such a beautiful color and is described as a “coral with golden/bronze shimmering nuances.” To me, it is a mid-toned, peachy coral with a soft pink sheen, and very subtle golden/bronze sparkle. The overall color leans slightly warm, but it isn’t so warn that those with cooler skin tones cannot pull it off. Those with darker or deep complexions may wish to use this as a colorful highlight. This shade applied evenly on my cheeks, was nicely pigmented, fairly easy to blend, and lasted about 5 hours before it began to fade. Even after much of the underlying color was gone, my cheeks were left with a soft glow from the product’s sheen. The shimmer didn’t really emphasize my pores. With the amount of shimmer MSFs have, emphasized pores can occur. The texture is finely milled and only slightly powdery-typical of mineralized products. What I found interesting about this shade is, in certain lighting, it not only highlighted my cheeks but slightly contoured them as well-something unexpected. 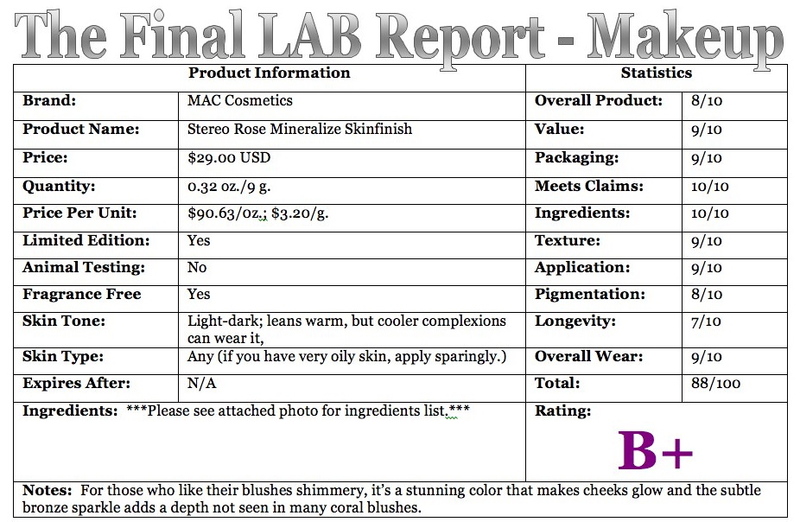 Mineralize Skinfinishes are supposed to be “velvet[y]-soft powders with [a] high-frosted metallic finish.” They can add an ultra-highlght to the cheeks, or a nice glow when lightly applied all over the face. You can also intensify the color by applying them wet. Also, depending on the veining, the color and amount of sparkle can slightly vary from compact to compact. Personally, I love Mineralize Skinfinishes! I generally use them as a setting powder (Lightscapade is my go-to) and a way to give my face a nice glow. Also, they look so darn interesting in the compact. What I don’t like about MSFs is their longevity. They just do not last as long as other cheek/face products, and I really do not like to have to re-applyy face products. Stereo Rose is not an insanely unique color, but I understand its allure. The subtle bronze adds a depth that many other companies have not captured with their coral blushes.